Astronaut's First Spacewalk Photos Are Out of This World! French astronaut Thomas Pesquet of the European Space Agency snaps his first space selfie during his first spacewalk, on Jan. 13, 2017. French astronaut Thomas Pesquet, a first-timer aboard the International Space Station, ventured out into the void of space for his first spacewalk on Friday (Jan. 13). While he spent nearly 6 hours working outside the orbiting laboratory, Pesquet snapped several photos, including some spectacular self-portraits. Pesquet may be a spacewalking rookie, but he breezed through this first spacewalk like a veteran. NASA astronaut and International Space Station (ISS) commander Shane Kimbrough joined Pesquet on the spacewalk, and the duo finished all primary objectives in half the allotted time before knocking out the entire list of optional "get-ahead" tasks. Both Kimbrough and Pesquet carried cameras during the spacewalk to photograph parts of the space station for ground controllers, who will use the pictures for future reference and planning upcoming EVAs (extravehicular activities). Pesquet took also took the opportunity to snap his first-ever spacewalk selfie. 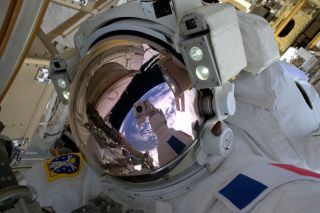 Planet Earth and Pesquet's camera-wielding hand are seen in the reflection of the astronaut's gold-tinted sun visor. The camera is strapped to the hand of Pesquet's Extravehicular Mobility Unit (EMU), or spacesuit, to keep it from floating off and getting lost in space. French astronaut Thomas Pesquet's feet dangle about 250 miles (400 kilometers) above the Earth in this photo taken during his first spacewalk, on Jan. 13, 2017. In another spacewalk photo, Pesquet points the camera down at his feet and to the Earth below — 250 miles (400 kilometers) below, that is. "This is what a spacewalk is: 400 km of void under your feet," Pesquet tweeted along with the photo. To the right of his dangling legs is what appears to be either a Russian Soyuz or Progress spacecraft currently docked at the space station. When Pesquet isn't spacewalking outside the ISS, he still takes plenty of photos of Earth from inside the orbiting lab. Check out more of Pesquet's amazing photos from space in this Space.com gallery.